President Duterte during a visit to the war-ravaged city of Mindanao after jihadists had seized control of the city, holding it under a six-month siege. The Armed Forces of the Philippines has denied rumours circulating on social media that a military command had withdrawn support from President Duterte. Col. Arevalo said the “fake statement” circulating on social media was “obviously” a handiwork of “individuals who intend to sow discord in and to discredit the AFP as a professional organisation”. The denial follows today’s controversial Supreme Court vote to remove Chief Justice Maria Lourdes Sereno, an appointee of President Aquino described as an “enemy” by the current president. There has also been reports that soldiers have been demoralised over the continuing encroachment of China into Philippine territory in the South China Sea. According to the widely-shared message, soldiers of the “Southern Command” withdrew support from the government of President Duterte. Southern Command or “Southcom” is a now-defunct military unit, previously responsible for the entire island of Mindanao. It has since been divided into two parts — the Western Mindanao Command and the Eastern Mindanao Command. The first is focused on fighting terrorist groups and the second communist insurgents. “A Messenger post purportedly from the soldiers of the ‘Southern Command’ allegedly withdrawing support from government and the president and encouraging other AFP units to follow suit is now circulating in social media. A few people sent it to me to determine its veracity,” said Col. Arevalo. There have been proposals to combine the two commands into a single unit again. However, a final decision is yet to be made over the recommendation. 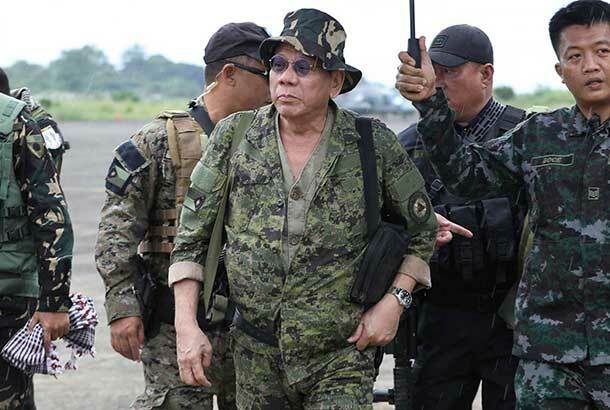 There’s much doubt about the accuracy of the reports of the military backing away from supporting the dictator-to-be, but there’s no doubt that in that photo, he’s dreadfully abusing the fine uniform of the Philippine military. Yet his supporters will come up with some excuse for it, just as they also justify his childish language, his hatred of God, his frequent-and-flagrant adultery, his shredding of the Philippine Constitution, his hatred of the Philippines’ best ally (USA), and his love affair with the Philippines’ worst enemy (China). We do not hate the President–we pray for him to have a long, happy life. We do not want him overthrown. But we are calling on him to repent, and to serve this country with honor.